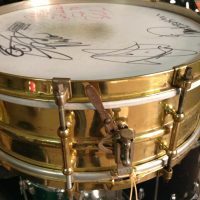 5×14, NSN, Heavy brass shell (like standard) 10 tube lugs. Clip hoops, Time Piece throw off. 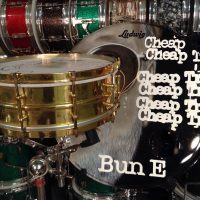 This drum was Bun E’s “go-to” snare with Cheap Trick between 1985-1991. He used it in live performances and on the Lap of Luxury and Busted albums. 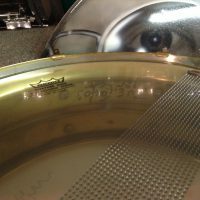 This drum really rocks! 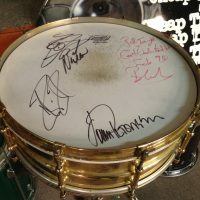 Head signed by all original members of Cheap Trick. COA signed by Bun E. Carlos and seller. Single click on image to enlarge.